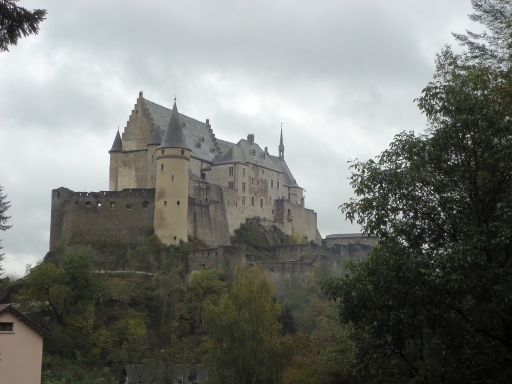 I recently went to Luxembourg to stay with Linda and Tom. It has been an actual decade since I last visited Linda in Luxembourg. (I can't believe it's been so long!) Since I last visited, Linda and Tom have got married, had kids, and moved into a lovely new house. They were very kind to let us all stay with them, because as well as myself, Nick, James, Eppa and James and Eppa's kids all came to visit. It was a full house! I think we picked the wrong weekend because weather was terrible. Then again, there's not much sightseeing you can do with small children, so instead we had a good time chilling out at home, eating lots of nice food that Linda made (there was also a fun raclette evening), and playing with toy trains. The kids are all really sweet. It was nice to see Rene, Alex and Jack playing together. Cara was a bit too young to join in, but at one year old she has grown into such a cutie-pie; whenever I sat next to her at mealtimes, she'd grab hold of my sleeve and stare at me with these big, wondering eyes. The kids all seemed to enjoy having so many grownups around to play with them. Poor Alex even started crying when it was time for us to leave for the airport, because he really wanted us to stay and play trains some more. It was such a lovely time. I didn't see Linda and Tom nearly enough last year, so it was great to catch up. The next task is working out when we can all meet up again. Soon, hopefully! We did go and do a tiny bit of sightseeing. Here are my photos. 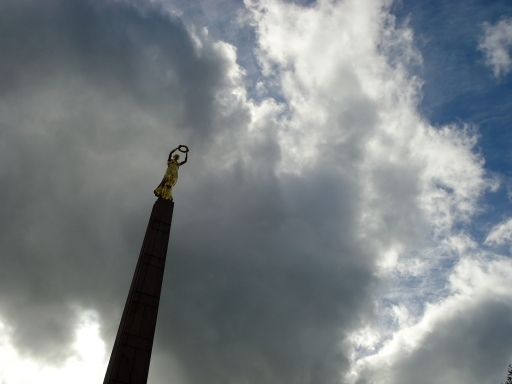 Gëlle Fra, the Monument of Remembrance. The really pretty view of Adolphe Bridge. 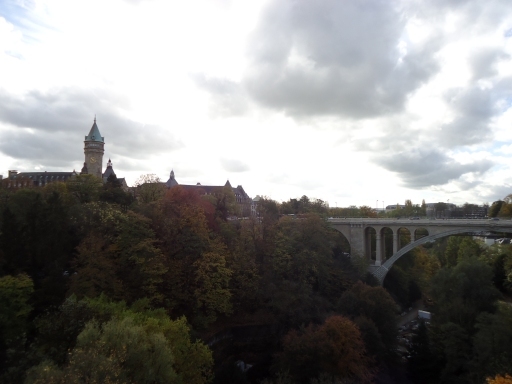 Luxembourg is a very hilly country, which makes for great views. I was so glad to visit in the autumn with the trees starting to turn colour. 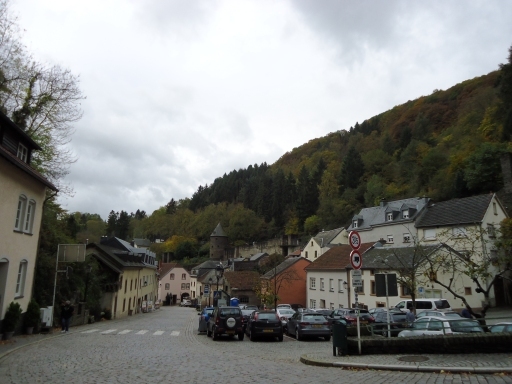 We also went to visit Vianden, which is a very pretty town, with old buildings, cobbled streets, and surrounded by steep wooded hills. 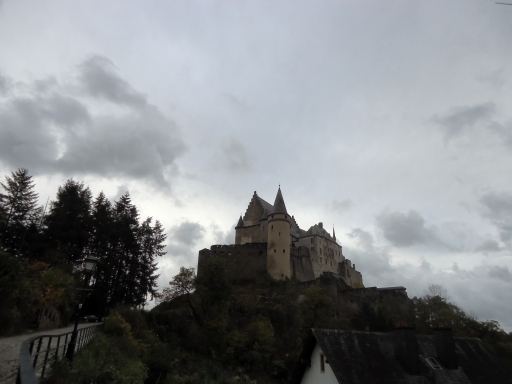 At the top of one of the hills is Vianden Castle. It's really striking and makes a great impression when you're driving in and it's suddenly revealed as you turn a corner. It looks very much like a fairytale castle if you ask me. 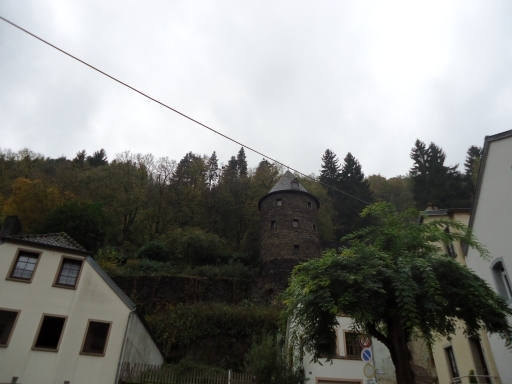 The whole town was fortified in the past, and it's still surrounded by walls and turrets. 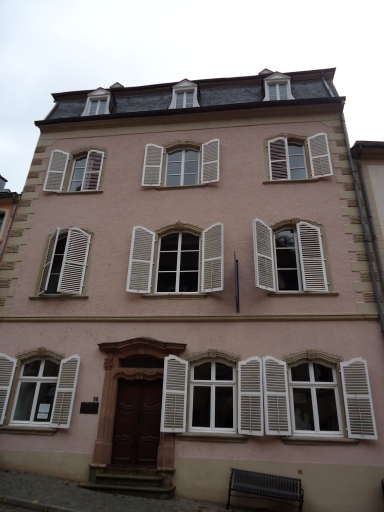 We walked past many pretty buildings in Vianden on our search for a child-friendly restaurant. 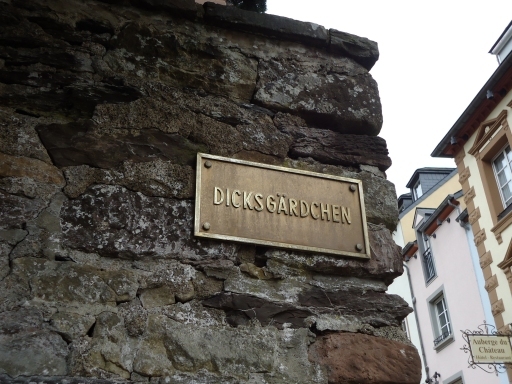 We also passed this place (translation: Dicks Garden). Dicks is the pen-name of Edmond de la Fontaine, the national poet of Luxembourg. Which is all well and good, but I am also 10 years old and must take a photo of every sign that says Dicks on it. What about the food you’ve been cooking? ?